A definite extension of the Brexit deadline: to extend the end-date for the article 50 process (the legal process for leaving the EU) by two weeks – to Friday 12 April. A further provisional extension: to extend this further, to 22 May, if the UK Parliament votes in favour of the Withdrawal Agreement previously agreed between Theresa May and the EU (this is the agreement MPs have already voted down twice). If the UK Parliament does not approve the Withdrawal Agreement but wishes to avoid a no-deal Brexit on 12 April, the UK Government will need to set in train UK participation in the European Parliament Elections and set out a convincing plan B for next steps and a longer extension of article 50, agreed with the EU leaders - all by 12 April. Next week the government will bring forward the legal process to change Brexit day in UK law from 29 March to 12 April. To fast track the process, this will require debate in the House of Commons and House of Lords to make the legal change by the end of the week. Currently UK law states that the UK will leave the EU at 11pm on 29 March. If this is not changed, we would have a legal limbo as the EU now considers that the UK is a member of the EU until 12 April. Hopefully this will all be straightforward – but who knows in British politics these days. This does mean there remains a slim possibility of some kind of no-deal Brexit on 29 March. Next week the government will also bring forward the third ‘meaningful vote’ – a vote seeking MPs’ approval of the Withdrawal Agreement (the agreement MPs have voted down twice already). 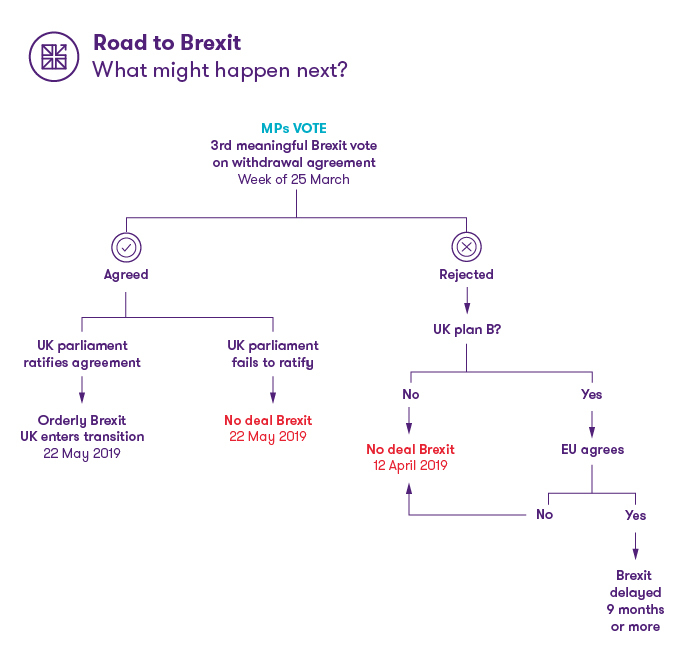 Here’s our latest decision tree of what could happen. If MPs approve the Withdrawal Agreement, then we will have eight weeks before the UK leaves the EU on 22 May. During this period the Withdrawal Agreement will need to be ratified by the European Parliament and turned into a UK law. The latter will provide ample opportunities for continued Brexit shenanigans by MPs, with no certainty of the outcome unless and until the Withdrawal Agreement is incorporated into UK law (to the satisfaction of the EU). A no-deal Brexit remains a distinct possibility at the end of this. The odds on MPs approving the Withdrawal Agreement look slim right now. Positions softened at the start of this week and then hardened significantly on Wednesday. This week has been very damaging to the Prime Minister’s political credibility and she has lost authority within her own party, making it very difficult for her to secure a vote in favour of her deal. But she will undoubtedly do everything possible to try get the deal over the line. If MPs reject the Withdrawal Agreement next week, then we really don’t know what will happen next. They will have two weeks to come up with a Plan B and agree it with the EU. At this point we could face: a softer Brexit, engineered by cross-party backbench collaboration; and/or a second referendum; or a conscious or accidental no-deal. The Government, or MPs on their own initiative, may organise a series of ‘indicative votes’: a kind of parliamentary multiple choice to find out what (if any) Plan B might secure a majority of MPs. If MPs agree on a Plan B and want a longer extension of article 50 to sort it out (with the UK remaining a member of the EU beyond the end of May), they will also need to agree that the UK will participate in European Parliament elections in May. 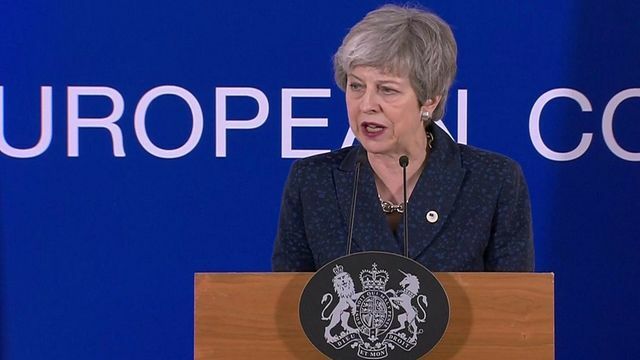 Any Plan B , including a longer extension of article 50, would then need to be agreed with EU leaders (subject to any terms and condition the EU might impose) by 12 April (the deadline for the UK to call European Parliament elections). There is also a possibility that the Withdrawal Agreement gets voted through with some amendments, which could give us a combination of any of the outcomes above. All of this is taking place in highly volatile political situation, with the possibility of ministerial resignations, moves to oust the Prime Minister, and even plots to create a government of national unity that cuts out both main party leaders. Any decision on Brexit risks splitting asunder both the Conservative party and Labour party. This makes things all the more unpredictable. EU leaders have provided a breathing space that hopefully removes the risk of a no-deal Brexit on 29 March. But this also creates more short-term uncertainty for business. For now we have at least three dates in the mix for Brexit plans: 29 March, 12 April and 22 May. Some of my clients are now focusing on 12 April as the new D-day for no-deal Brexit plans. The risk averse will also want to maintain plans for no-deal on 29 March for now. The situation remains fluid, so it makes good sense to keep all options under review over the coming days. Leadership teams should consider what makes most sense for their organisation and be ready to act quickly or adapt their plans. The bottom line is that a no-deal Brexit on 12 April looks a distinct possibility and should form the central planning scenario for any organisation; and businesses should keep the situation under constant review and be ready respond quickly. For those organisations who have detailed plans or are implementing Brexit plans already, now is a time to review and adjust to more uncertain timings. Assess critical projects being delivered in April and May through to July; review stock plans; and assess whether any later seasonal demands start to affect planning (e.g. in retail we may avert no-deal during Mothers’ Day, but Easter comes into sharper focus now). Keep talking to your customers and suppliers. And keep a watch on cashflow implications of abnormal stock and sales patterns and any variation in payment periods. For many organisations, the extension of article 50 – whether to April 12 or May 22 – provides more time to prepare. Events of recent weeks have shown that business can not to rely on government and politicians and should make their own plans. We have seen more of our clients planning for Brexit in recent weeks, as they give up on waiting. If you are not yet ready for Brexit you now have three weeks to do so: clear your diary, get your team together and get onto it; it is not too late, and our Brexit Essentials guide provides some actions you can still take. A no-deal Brexit on 12 April looks a distinct possibility and should form the central planning scenario for any organisation; businesses should keep the situation under constant review and be ready respond quickly. The extension of article 50 provides more time to prepare...if you are not yet ready for Brexit you now have three weeks to do so. Will MPs finally to take control next week to stop that? They’ve resisted it twice, partly because the precedent has big implications. Source says No10 in “panic mode”. Meaningful vote would still be held, but expectation is it will fail. Indicative votes would follow. Kwasi Kwarteng hinted this morning any such votes would be ‘free votes’ - not whipped. Emmanuel Macron told his counterparts that he thought there was a 10% chance of Theresa May's deal passing in Parliament.